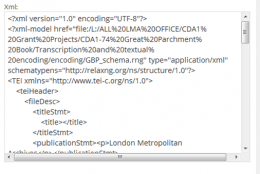 30 May 2018 was the fifth anniversary of the Great Parchment Book website. We were delighted that the website reached 150,000 views around a month before the anniversary, a fitting way to celebrate its success. 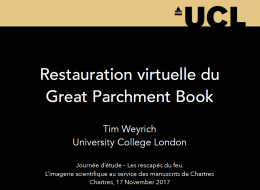 Views are now fast approaching 152,000, testament to the ongoing relevance of the Great Parchment Book as a resource and the significance of the project. 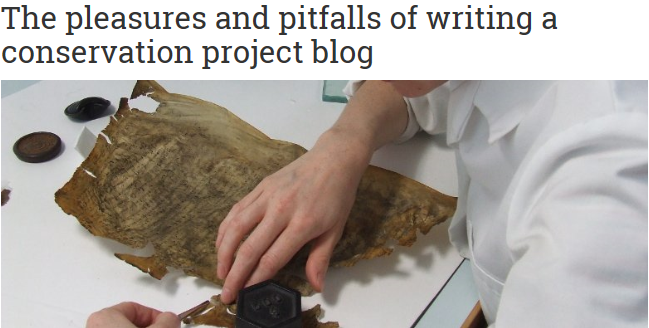 To mark the anniversary, we’re again taking a look at the project through numbers, from the names in the surviving folios of the book itself to the visitors to the website with some interesting facts along the way. 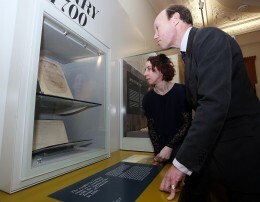 270,000 visitors to Plantation, People, Perspectives exhibition in Derry Guildhall in the first year (opened 30 May 2013) when an original folio of the Great Parchment Book was on display. 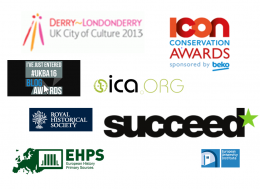 Almost 960,000 visitors to the exhibition to 30 May 2016 (several times the population of Derry and nearly half the population of Northern Ireland). Still going strong. 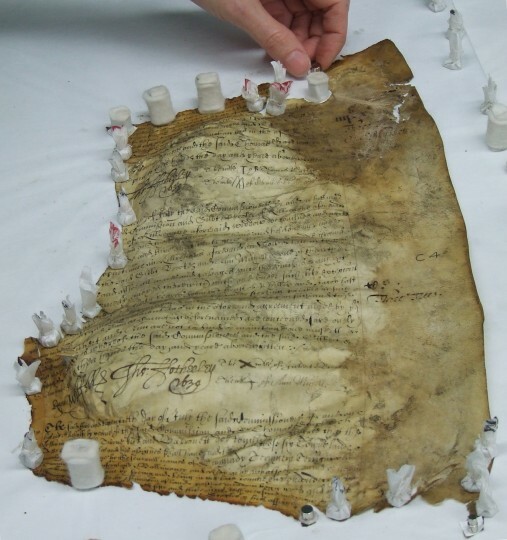 It is pleasing to be able to report that on the 4th anniversary of the launch of the Great Parchment Book website yesterday, the number of views of the site passed 130,000. 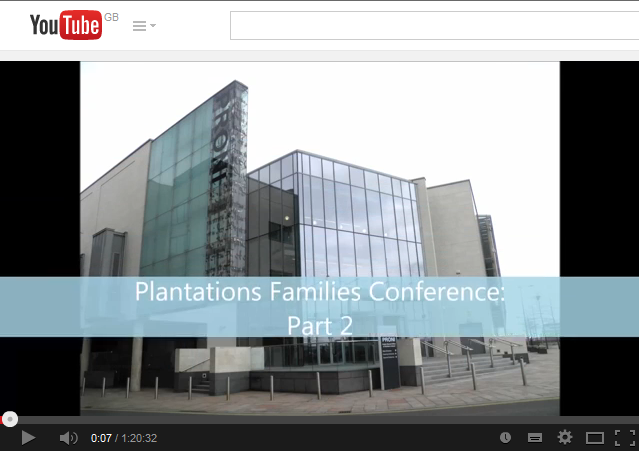 The website was launched on 30 May 2013 immediately prior to the opening of the exhibition “Plantation: Process, people, perspectives” in Derry Guildhall in June 2013 to commemorate the 400th anniversary of the building of the city walls in the year that Derry-Londonderry celebrated being the UK’s first City of Culture. 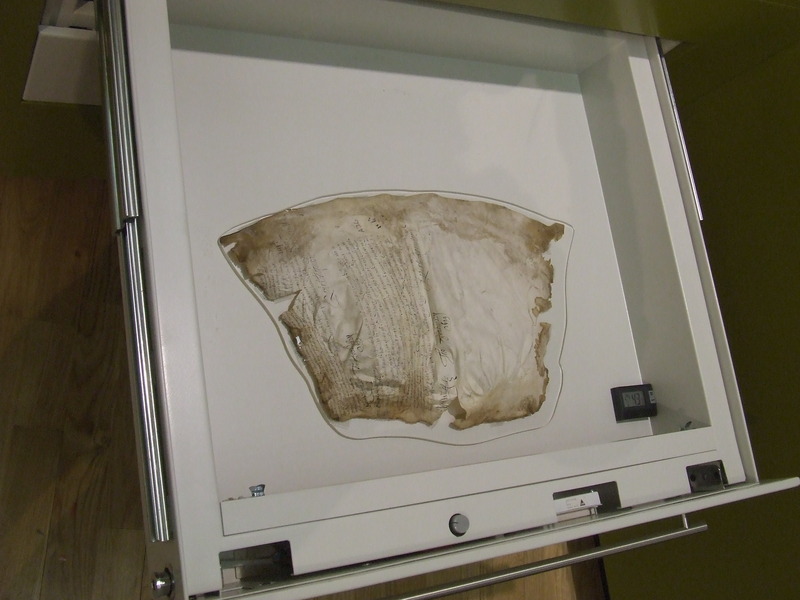 The digitally reconstructed manuscript, accessible for the first time in over 200 years via the dedicated website, took pride of place in the exhibition which has proved to be a great success and still running today. Here’s looking forward to at least 150,000 views before 30 May 2018 when we will be 5 years old! 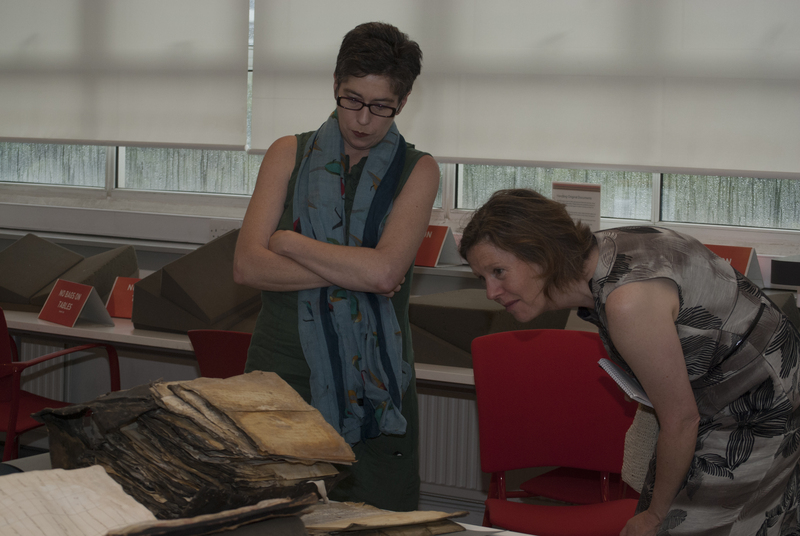 We also celebrated the anniversary with a curator’s talk on the Great Parchment Book in the Heritage Gallery at Guildhall, where three folios of the book are on display, on the first ever London History Day today (31 May). 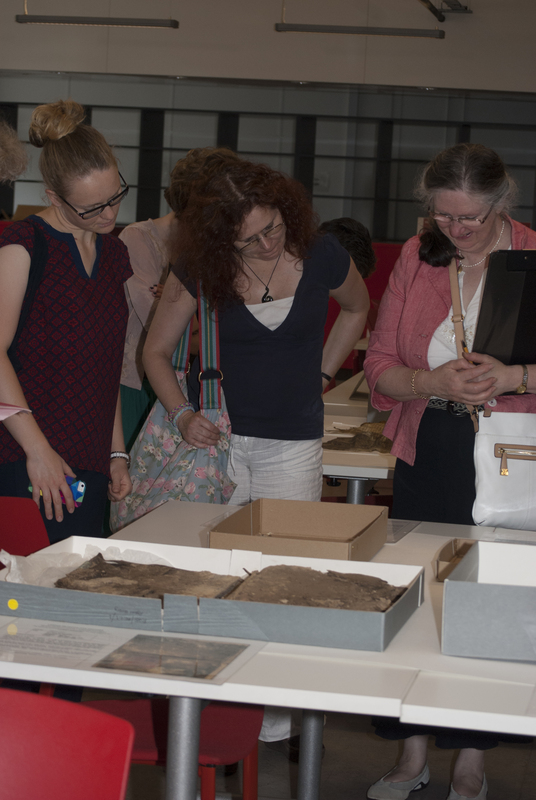 This event was also part of a programme celebrating the 950th anniversary of the City of London Corporation’s extensive archives in 2017. The members of the small, but attentive audience had obviously done their research before hand and had lots of interesting questions. Several were going on to other London History Day events in the City of London and beyond, including at London Metropolitan Archives. It is great to be able to showcase some of the archival treasures held by the City of London as part of this new venture. 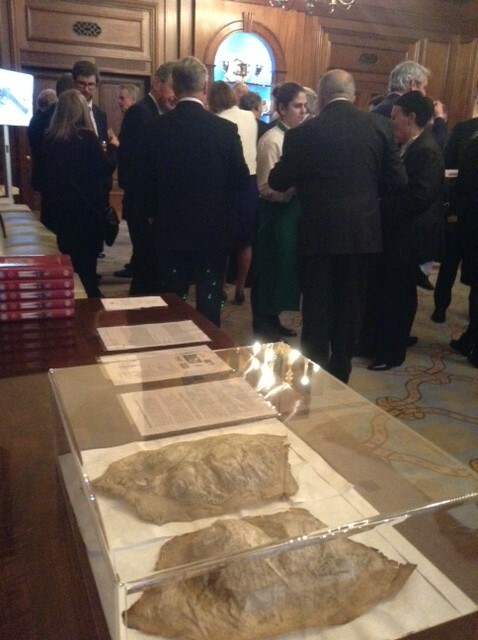 Two original folios of the Great Parchment Book were on display at a reception at Girdlers’ Hall on Monday 8 May 2017 held by the Honourable The Irish Society for the City of London livery companies and the City of London. 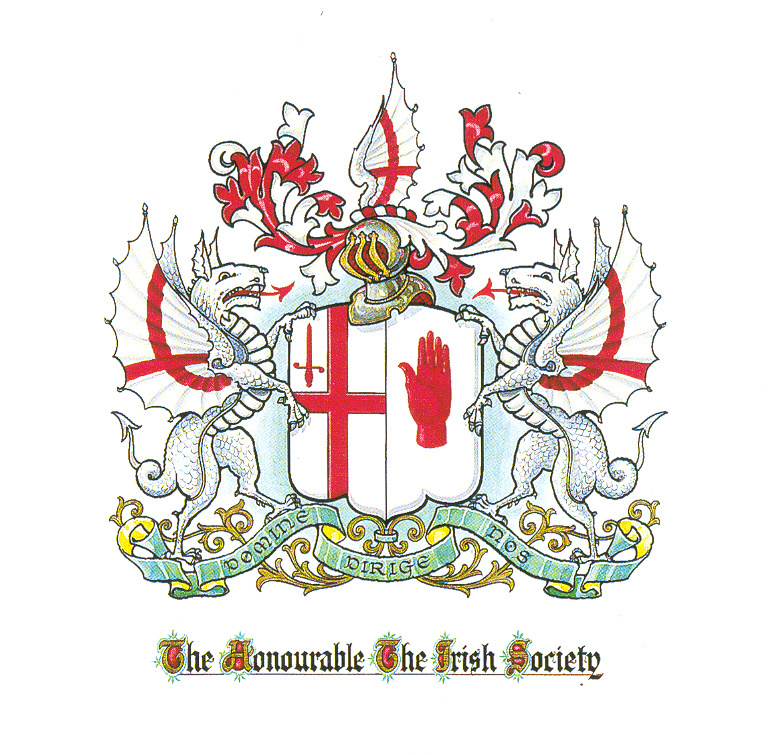 The reception provided an opportunity for attendees to learn more about the Honourable The Irish Society’s charitable grants programme and mission to strengthen the special relationship between the City of London and Northern Ireland that has existed for over 400 years. Guests were invited to reconnect to a shared history, and engage with the continuing social and economic development of the Province. A piper from the 1st Battalion the Irish Guards provided a musical accompaniment to the start of the evening, before guests were welcomed by The Reverend Sir George Newton, Bt, Master of the Worshipful Company of Girdlers. Quietly passionate speeches from Alderman Sir David Wootton, Governor of the Irish Society and Deputy Henry Pollard, Deputy Governor followed, with Mr William Charnley, master of the Worshipful Company of Drapers talking about his own company’s contribution to charitable causes in Northern Ireland through the Irish Society. The Girdlers’ Company Beadle, Robert Young, was master of ceremonies and cheerfully, but firmly kept us all in order. There was much interest in the folios of the Great Parchment Book on display. 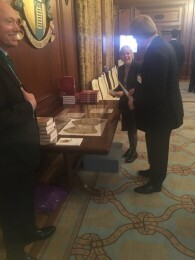 The City of London, eight of the Great Twelve of the City of London livery companies and the Irish Society had all contributed to the project to conserve and digitally reconstruct the book, and it was a pleasure to talk about this important source for the history of Northern Ireland, and the project to make it accessible again after 200 years, to members of the livery companies which are represented in the book. 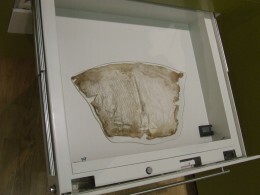 The two folios displayed were of Fishmongers’ Company lands (folios F7v and F8r) chosen as much for their physical appearance (distortion, shrunken text, evidence of singeing) as much as content. A modern transcription of the pages taken from the Great Parchment Book website was supplied. The folios were carefully presented under a bespoke Perspex dome sitting on the Tyvek sheets which usually support them in their bespoke packaging. 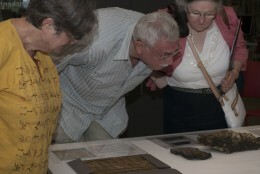 This gave guests the rare opportunity to view the original folios at close quarters, at the same time keeping them safe. 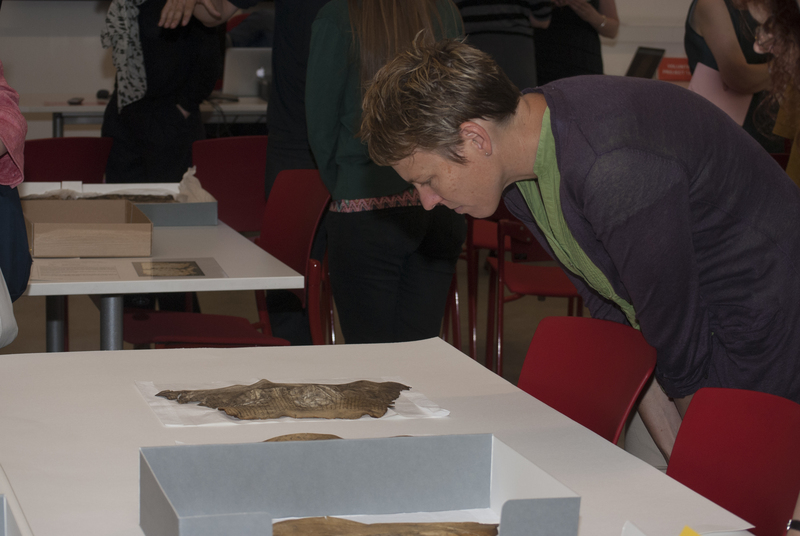 Philippa Smith from London Metropolitan Archives was on hand throughout the evening to keep a close eye on the folios as well as to answer questions. 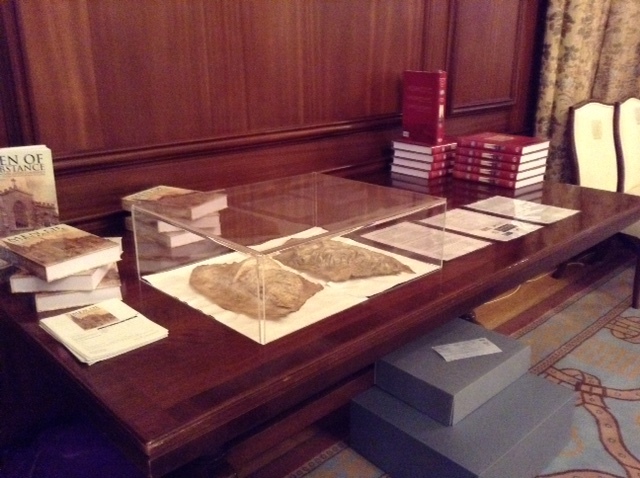 Thanks go to Robert Young, Beadle of the Girdlers’ Company and his staff for looking after the folios in secure storage before the after the event, and to the support of the Irish Society, especially Edward Montgomery, Secretary, who had suggested London Metropolitan Archives should bring the folios along to the event. 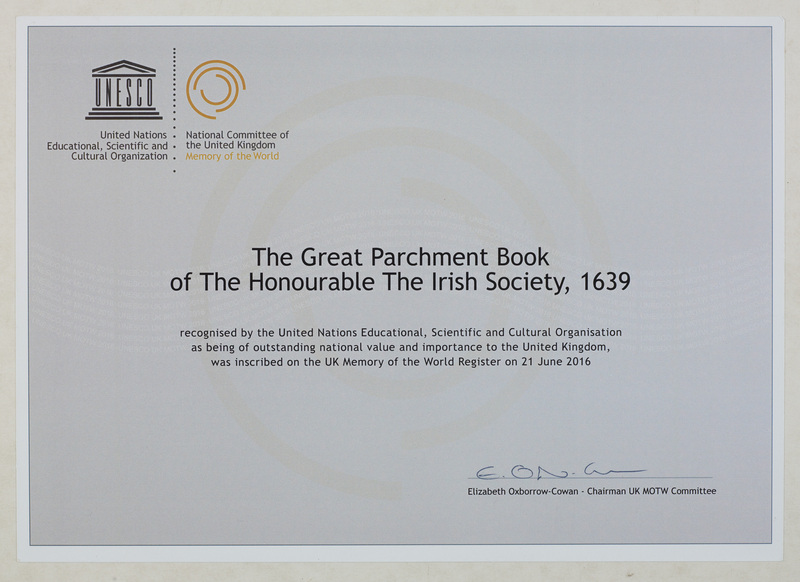 We are delighted to announce that on 21 June 2016 at the UK Memory of the World awards at the Senedd in Cardiff, the Great Parchment Book of the Honourable the Irish Society was inscribed to the UK register of the UNESCO Memory of the World. 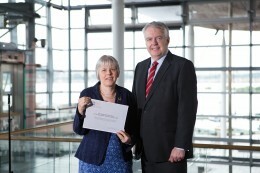 Philippa Smith, representing London Metropolitan Archives, was presented with the award certificate by Wales First Minister Carwyn Jones who gave the keynote speech. 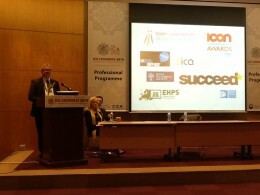 The opening speech had been given by Gary Brace from the UK National Commission to UNESCO. 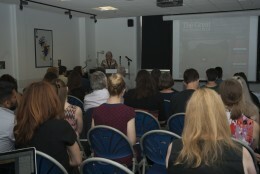 Chair of the UK Memory of the World Committee Elizabeth Oxborrow Cowan also spoke about the careful and skilful management needed to preserve our documentary heritage. The Chair of the All-Party Parliamentary Group on Archives and History, Chris Skidmore MP, sent a supportive message. Finally, a special award was made to George Boston and David Dawson who established the Memory of the World programme in the UK. In addition, congratulations are also due to the Churchill Archives and the Haig Papers. These Inscriptions have been added to the International Register, which celebrates documentary heritage of outstanding international significance. These Inscriptions reflect the diversity of the UK’s rich documentary heritage, which is filled with stories about people, places and events. Documentary heritage is the documented memory of humankind, and it deserves to be cherished, celebrated, preserved and, above all, shared. 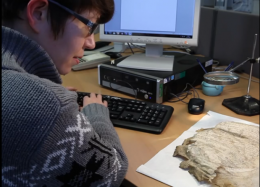 The Great Parchment Book has been recognised as a hugely significant record of the Ulster Plantation in the early 17th century, providing a unique insight into an important period of the history of Northern Ireland for which there are few other original archives surviving. It cannot be overstated how important the Plantation of Ulster was to the history of Northern Ireland, the United Kingdom and Ireland and it still has influence today. 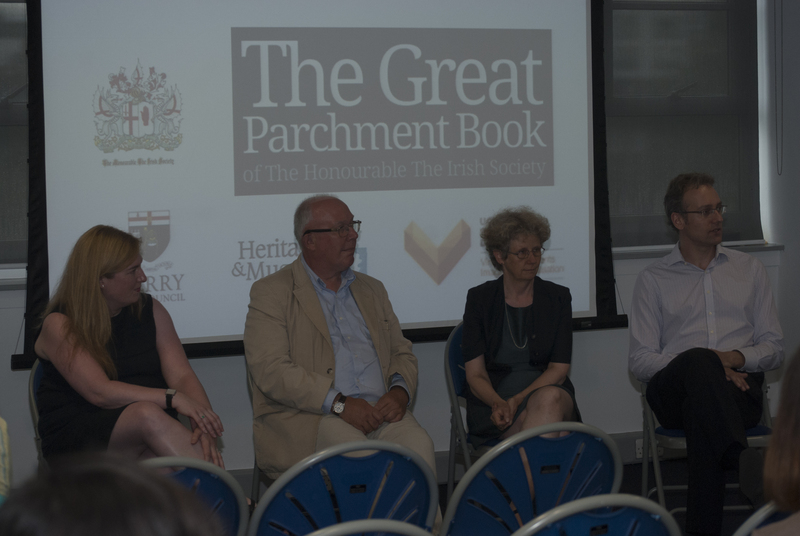 The Great Parchment Book is central to the study of the Plantation and the social, economic, cultural, religious, and political history of Northern Ireland. 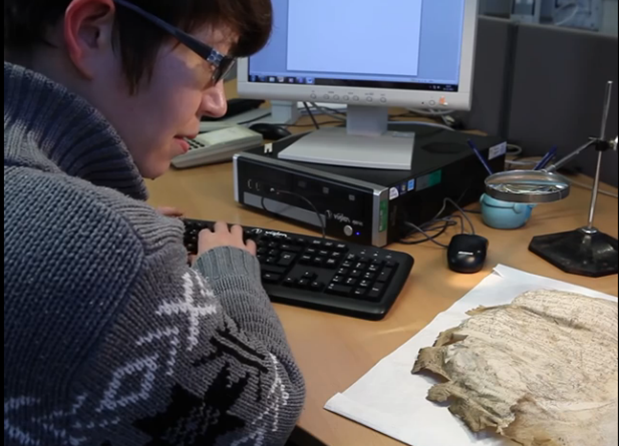 The Great Parchment Book provides a key record of the population of early 17th century Ulster at the time of the Plantation, not just the Protestant settlers who came from both England and Scotland, but also the native Irish, and exceptionally many women, at all social levels. 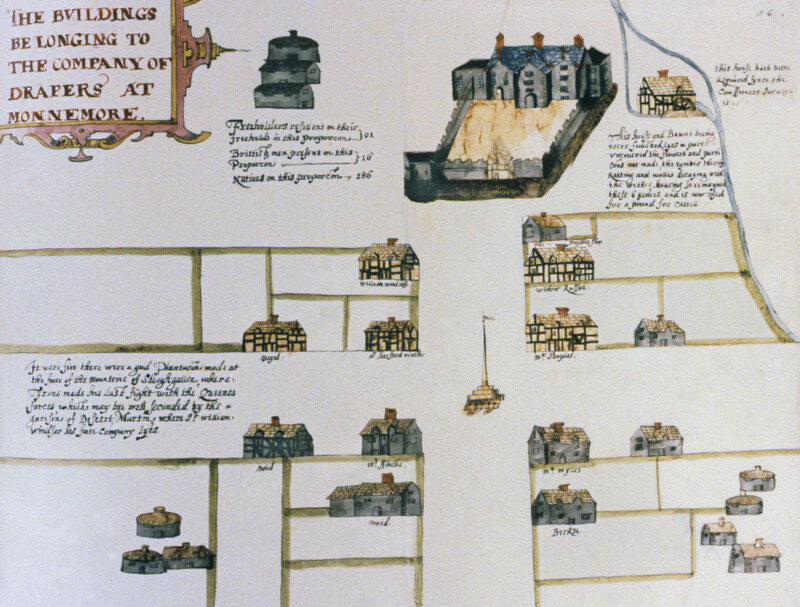 It contains unique information about the properties and individual buildings they inhabited, as well as the extent and layout of the towns of Coleraine and Londonderry. 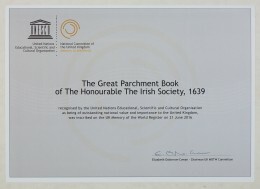 The Great Parchment Book has considerable significance for the people of Ulster, Northern Ireland and Ireland more generally; it is regarded as iconic by the Irish Society and the City of London. UNESCO established the Memory of the World (MoW) Programme in 1992. 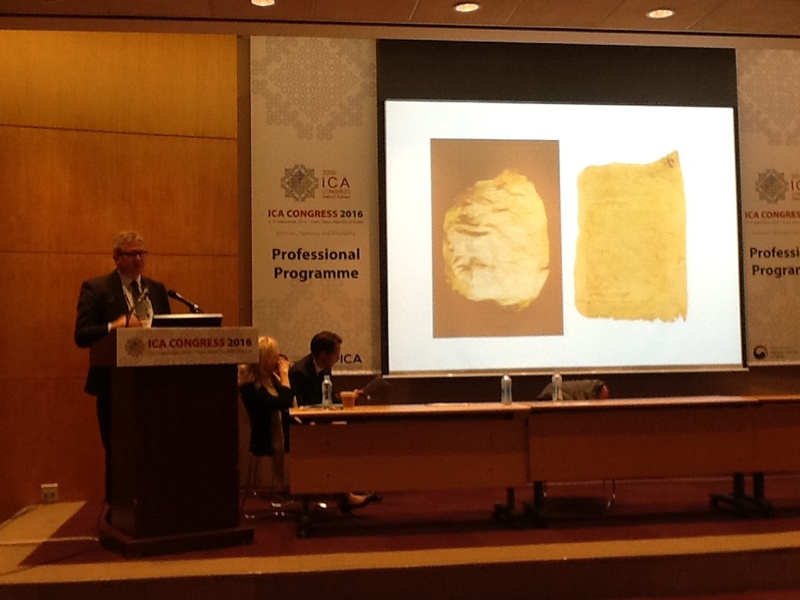 The programme vision is that the world’s documentary heritage belongs to all, should be fully preserved and protected for all and permanently accessible to all without hindrance. The UK Register (one of several country-level programmes from around the world) recognises documentary heritage deemed by a panel of experts to be of outstanding significance to the UK. 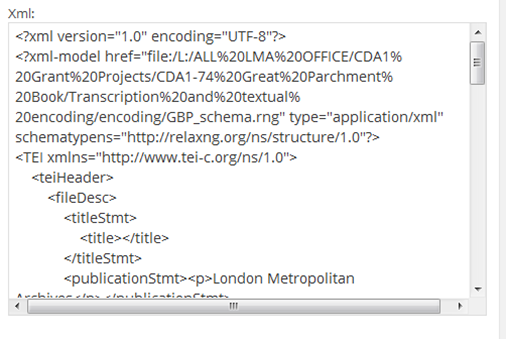 The seven new inscriptions join the 50 already listed on the UK register. The addition of the Great Parchment Book means that London Metropolitan Archives, City of London Corporation has four items inscribed to the UK Register, the other items being the Charter of William I to the City of London, London County Council Bomb Damage Maps, and Robert Hooke’s Diary, 1672-83. 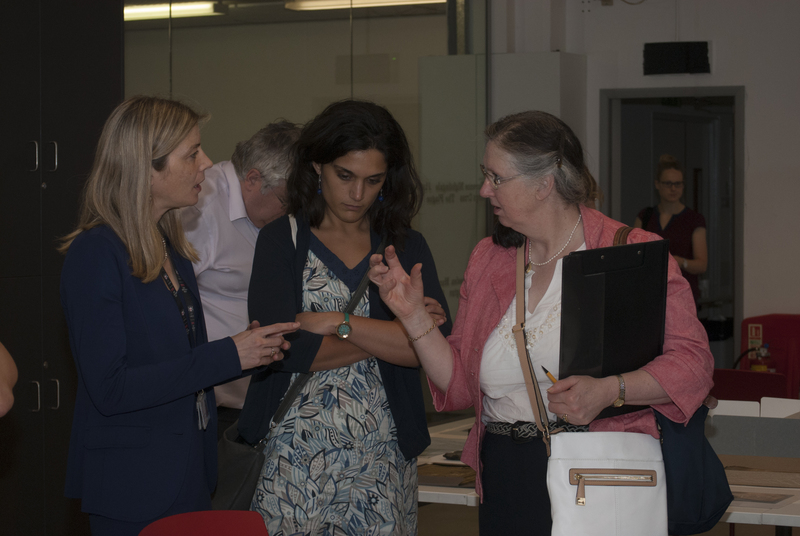 This is more than any other local authority archive service and demonstrates the importance of the History of London collections held by LMA which, along with the printed collections at Guildhall Library, are also Designated as Outstanding by the Arts Council England. Great Parchment Book was pleased and proud to be part of the UK Blog Awards with all the other finalists at the Park Plaza, Westminster Bridge, London on Friday 29 April 2016. 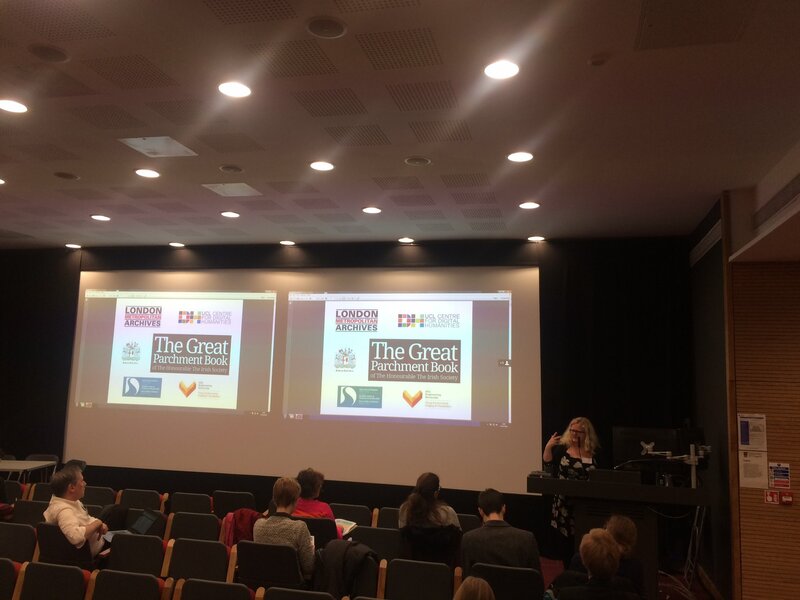 It was a fun event taking the theme of Roald Dahl’s Big Friendly Giant in the centenary year of his birth which seemed very appropriate given the focus of the 2016 Awards on storytelling. A stilt-walking BFG strode around the event, and there were lots of bubbles, not only alcoholic! One room was decorated with life-like looking trees and scenery, and the canapés were smothered in edible flowers continuing the theme. 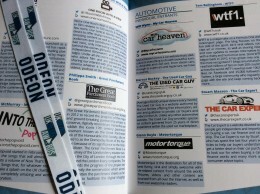 The headline sponsor, Odeon Cinemas, even had a pop-up cinema – with popcorn of course. There was a real buzz to the event with finalists not only enjoying their own moment of glory with their supporters, but connecting with other bloggers and finding out their stories, in my case ranging from the Cottages and Castles Blog (lettings agency business) to the Living With CMPA Blog (the personal story of a mum with a son with food allergy). 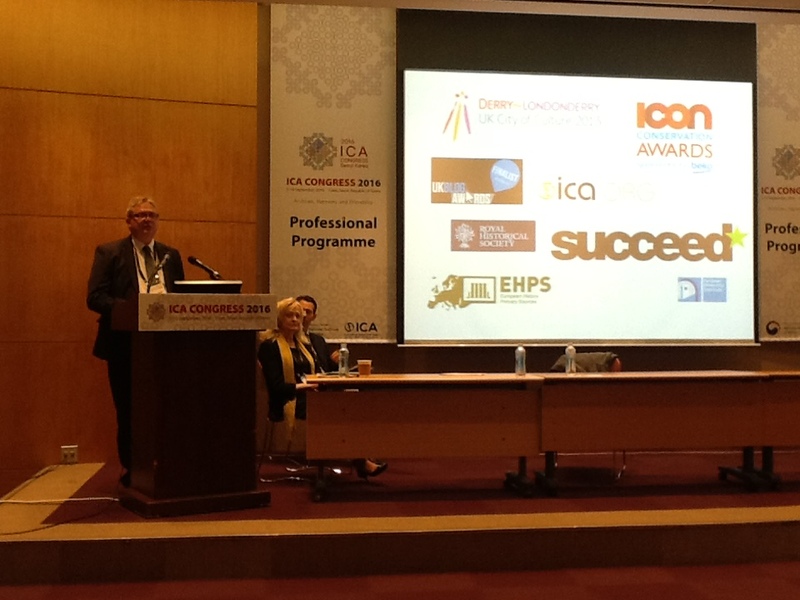 This interaction has continued after the event on social media and is an important part of the Awards ethos. The event was not only fun, but also slick. The host was Kate Russell with whom you may be familiar from the BBC’s technology programme Click. An award winner last year, she was warm, enthusiastic and funny, with a lovely line in off-the-cuff remarks when things didn’t go according to plan, but also super-efficient at keeping the awards presentation ceremony on track. After brief but pertinent welcome speeches from the UK Blog Awards Founder and MD, Gemma Newton, and Andy Edge, Commercial Director and Amy Rountree, Social Media Manager and Strategist, Odeon Cinemas, the awards were presented by category, with two highly commended in each, plus the winner. The Arts and Culture category was up first so I didn’t have to long to wait. The Great Parchment Book blog didn’t win, but it was great to see it up on the big screen with the other finalists all of whom were made to feel special. As Gemma Newton wrote in the Awards programme: “All of the shortlisted candidates should be hugely proud of what they’ve achieved to reach this final stage … winning a UKBA is not easy.” I was then able to relax and enjoy the rest of the ceremony and celebrate with my neighbour, the author of the Living with CMPA Blog who won her category. The Arts and Culture category was won by the Honest Actors’ Blog. The winner of the headline award for the Best Storyteller was the Royal Mint Blog. 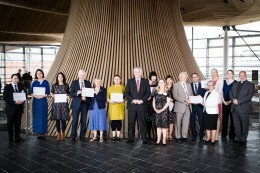 Very well done to all the winning blogs. 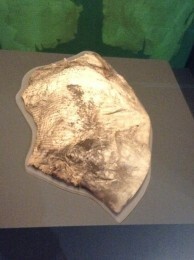 The Great Parchment Book was the only archive blog in the competition and the only finalist from the heritage sector (although the Royal Mint Blog has a heritage dimension). It would be great next year to see more archive and heritage blogs getting involved in the UK Blog Awards, and making it through to the final. The Great Parchment Book did it, your blog can too! 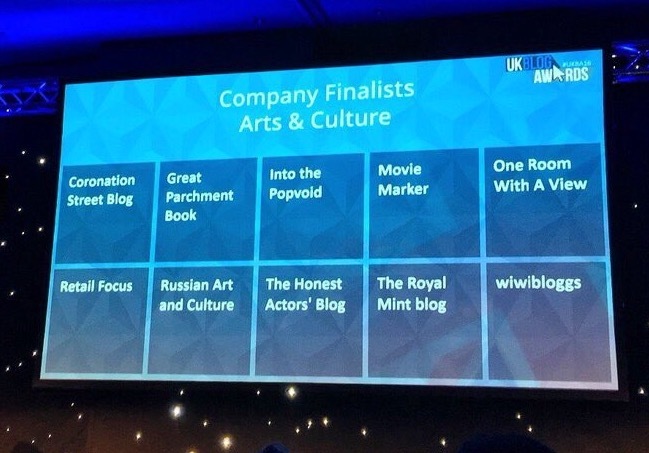 The Arts and Culture category is very wide, perhaps UK Blog Awards could encourage the heritage sector with a separate category, or at least make it Arts, Heritage and Culture? 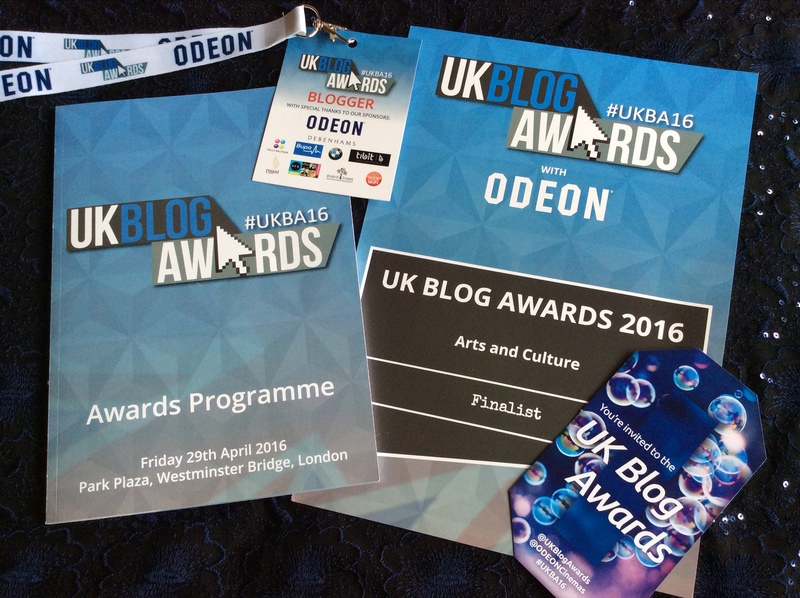 You can find out more about the UK Blog Awards on its website and on social media especially Twitter @UKBlogAwards #ukba16; and Facebook /UKBlogAwards. 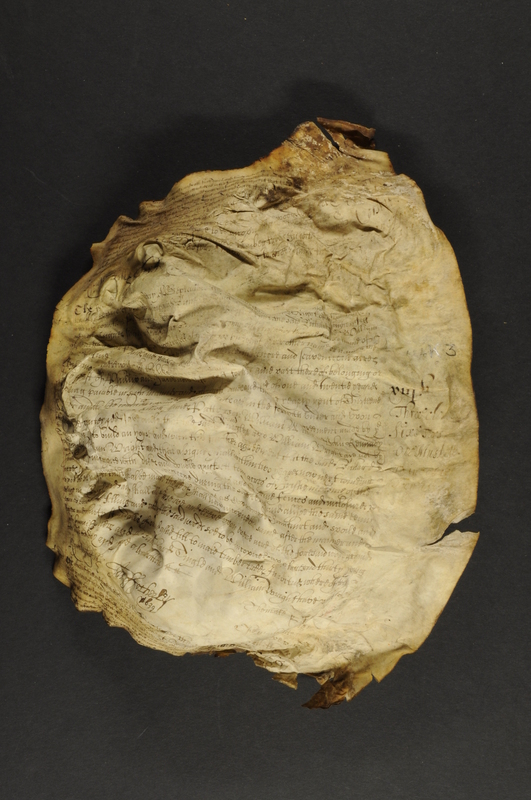 Continuing with the occasional series of posts reflecting on the different elements which make up the Great Parchment Book project, we now turn our attention to historical importance and synergy with other sources. 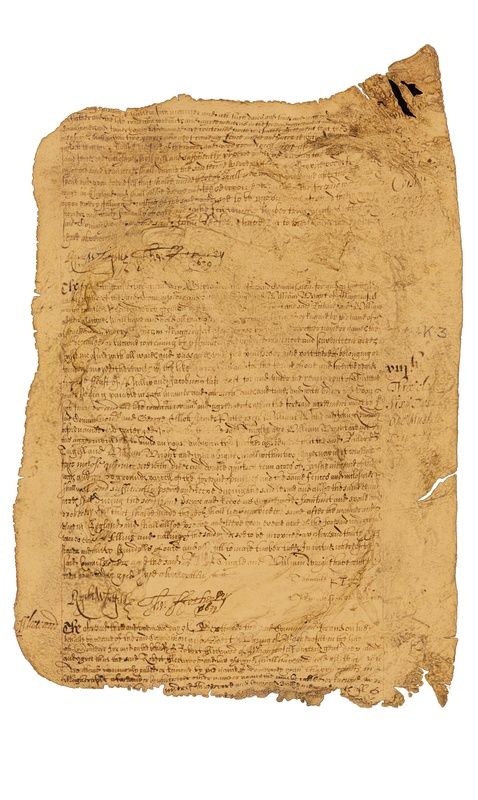 The Great Parchment Book is a hugely important record of the Ulster Plantation of the early 17th century documenting an important and formative period of the history of Britain and Ireland. It cannot be overstated how important the Plantation of Ulster was to the history of these islands and it still has resonance today. 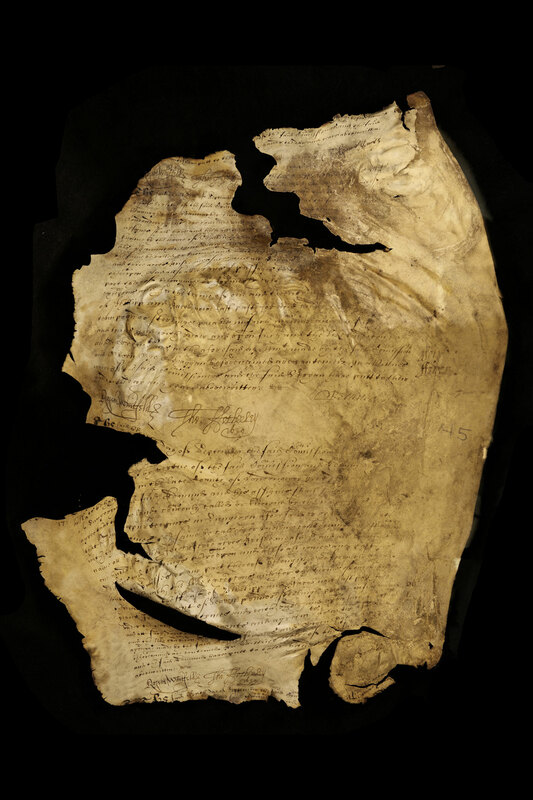 So important was the Great Parchment Book to the Irish Society that it was rescued from the fire at Guildhall in 1786 and carefully preserved in spite of its parlous state as it provided evidence of its property, rights and legitimacy. 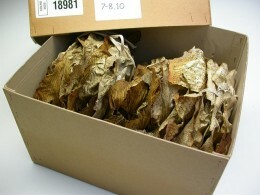 Original archives and other artefacts are considerably lacking for this period of Irish history. 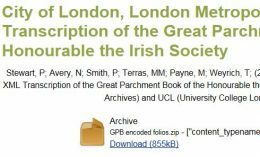 If the Great Parchment Book did not exist, key data about landholding and population in Ulster at this time (not only the English and Scottish settlers, but also the native Irish) at this crucial period would be undiscoverable. 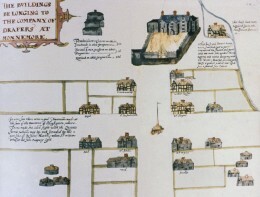 It contains unique information about properties and individual buildings, as well as their extent and layout including that of the towns of Coleraine and Londonderry. 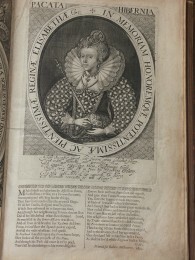 It also contains unique and exceptional information about the population from all social backgrounds including references to women about whom there is otherwise very little. 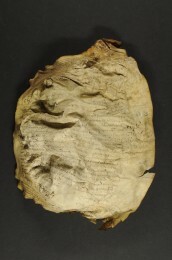 Although unique, the information contained with the Great Parchment Book has a synergy with others sources for early modern Ulster and we have explored some of these on the Great Parchment Book website. 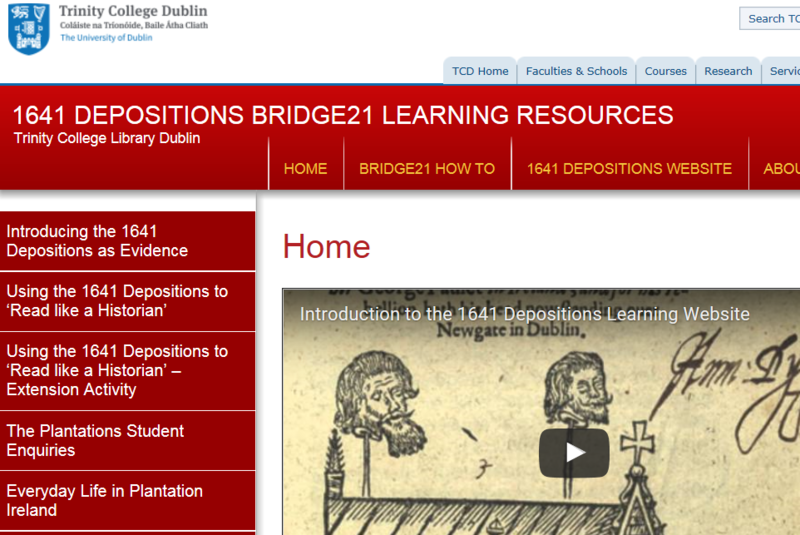 They include Thomas Raven’s maps of Londonderry, 1622, held at Lambeth Palace Library and Drapers’ Hall, the muster rolls held by the Public Record Office of Northern Ireland, and the 1641 Depositions (witness testimonies concerning experiences of the 1641 Irish rebellion) held at Trinity College Dublin Library which are also available digitally. 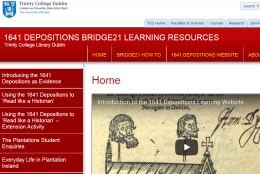 It is also useful to connect to other digital and published resources such as the digital atlas of Derry–Londonderry and the Irish Historic Towns Atlas, and publications of the Irish Manuscripts Commission. You can find out more about the history of the Plantation on the website and the synergy of the Great Parchment Book with other sources for the Plantation on the blog (go to the end of the page once you’ve clicked the link to read in chronological order). 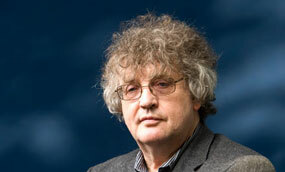 A copy of the published score of At Sixes & Sevens written by Northern Irish poet Paul Muldoon and composer Mark-Anthony Turnage has today been deposited in London Metropolitan Archives and placed with the archives of the Honourable the Irish Society. 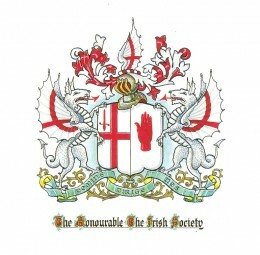 The new choral work At Sixes & Sevens was commissioned by the Irish Society and the City of London Corporation as a gift to mark their long association and the 400th anniversary of the Honourable the Irish Society, and to celebrate Derry as 2013 UK City of Culture. 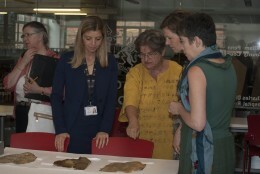 During his research for the cantata, Paul Muldoon visited LMA to explore the archives of The Honourable The Irish Society, and to see the Great Parchment Book. 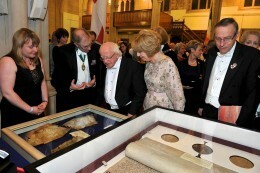 The world première of the cantata At Sixes & Sevens for soprano and baritone soloists, youth choir, chorus and orchestra was performed simultaneously in the two Guildhalls of London and Derry~Londonderry on 3 July 2013. On 17 March (St. Patrick’s Day) 2014, Paul Muldoon received the Freedom of the City of London at Guildhall in recognition of his outstanding contribution to poetry. The score of At Sixes & Sevens is published by Boosey and Hawkes and the deposited copy is available for general access at LMA under reference CLA/049/RD/02/044. Great Parchment Book is UK Blog Awards finalist! 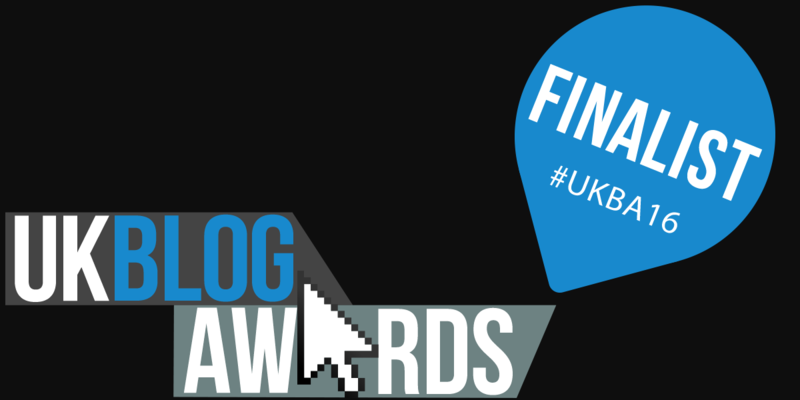 Thanks to your votes, the Great Parchment Book blog has made it to the final of the UK Blog Awards 2016. 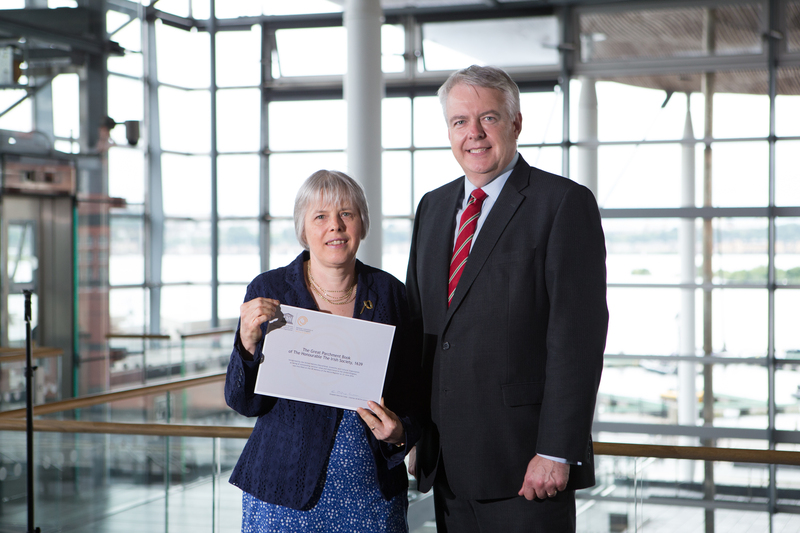 A tremendous achievement which took us all by surprise: we are absolutely delighted. 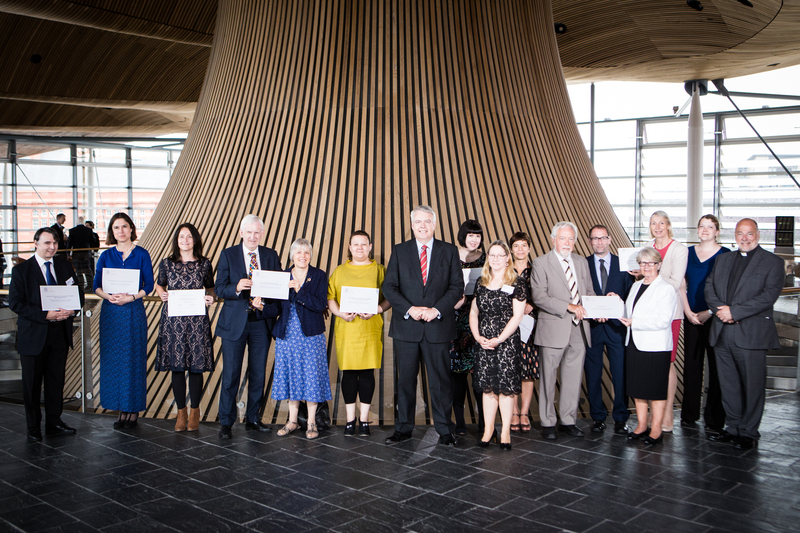 As you can see from the shortlist for the Arts and Culture category, we are up against some stiff (and very diverse) competition, but it’s up to the judges now who have a tough job ahead of them. Judging begins on Monday 1 February and will be carried out remotely until 19 February 2016. We are invited to connect with the judges across social media during the process. 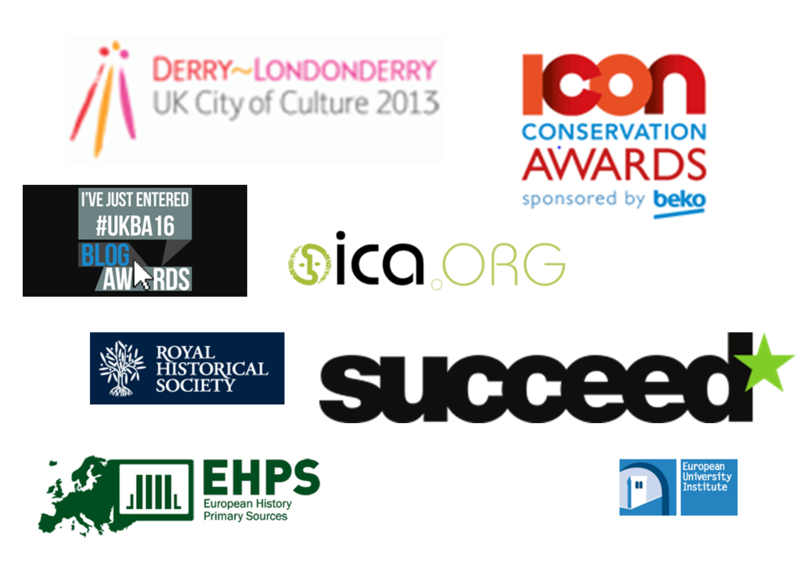 You can find out more about our judges here if you’d like to participate. 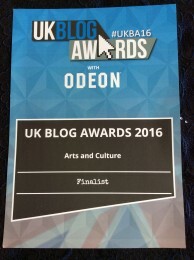 You can also follow the competition on Twitter @UKBlogAwards #UKBA16. The winner will be announced at a dazzling awards ceremony at the Park Plaza Hotel, Westminster, London on Friday 29 April 2016. Once again, very many thanks for your support. We’ll of course let you know how we get on. Last day to vote for the Great Parchment Book blog! There’s only a day left to vote for the Great Parchment Book Blog in the Arts and Culture category of the UK Blog Awards 2016. 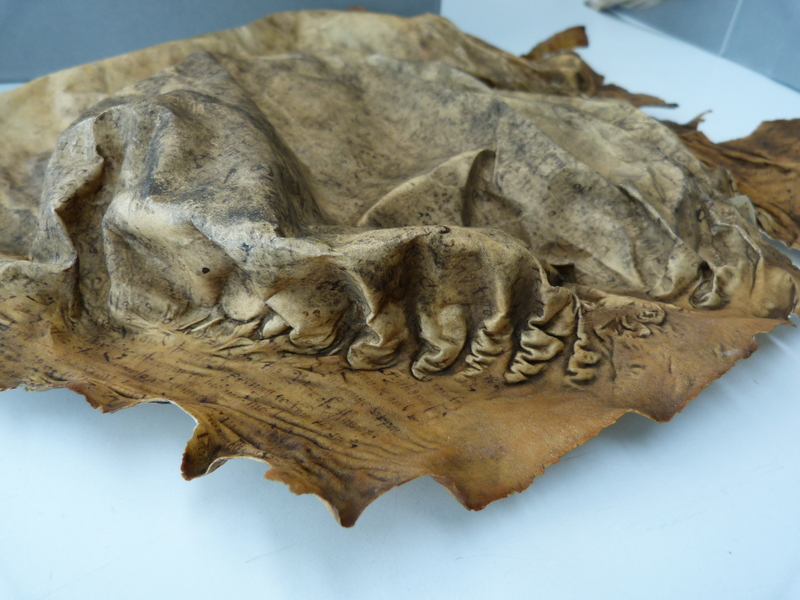 If you haven’t voted already, it would be really great if you would show your support for the Great Parchment Book project by voting as this will enable the blog to progress to the final of the awards. Voting is closes at 9pm today (Monday 25 January 2016), so please don’t delay, make sure you vote for the Great Parchment Book blog now! Only a week left to vote for the Great Parchment Book blog! There’s only a week left to vote for the Great Parchment Book Blog in the Arts and Culture category of the UK Blog Awards 2016. Voting is open until Monday 25 January 2016 at 9pm, but please don’t delay, make sure you vote for the Great Parchment Book blog today! 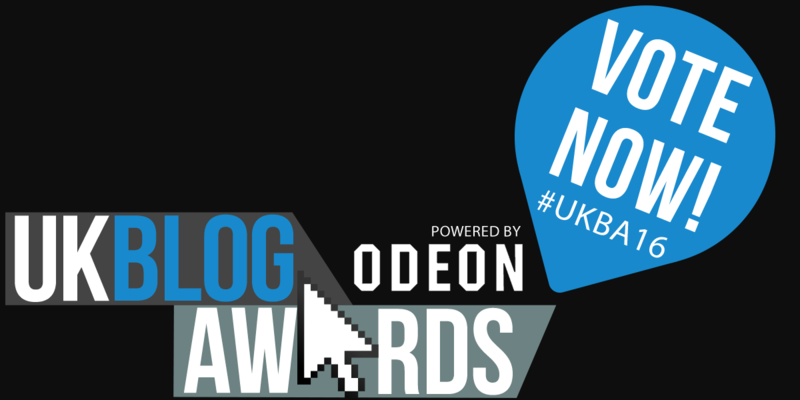 UK Blog Awards – vote now! We are pleased to announce that the Great Parchment Book Blog has been nominated in the Arts and Culture category of the UK Blog Awards 2016. 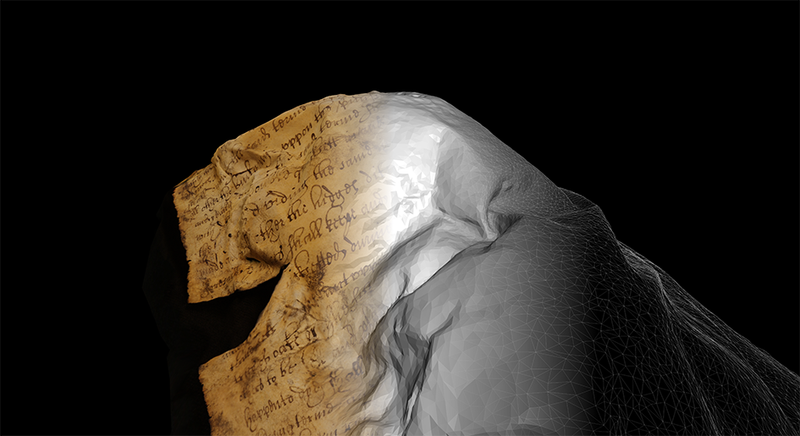 The Public Vote opened today and it would be really great if you would show your support for the Great Parchment Book project and the blog by voting to enable us to progress in the awards. Voting is open until Monday 25 January 2016 at 9pm, but don’t delay and vote for the Great Parchment Book blog now! 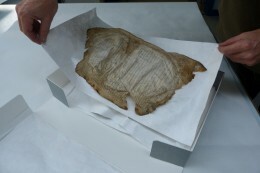 The blog puts the Great Parchment Book in its rightful place at the heart of the study of the history of the 17th century Plantation of Ulster and links it directly to other sources, current academic scholarship and other research. 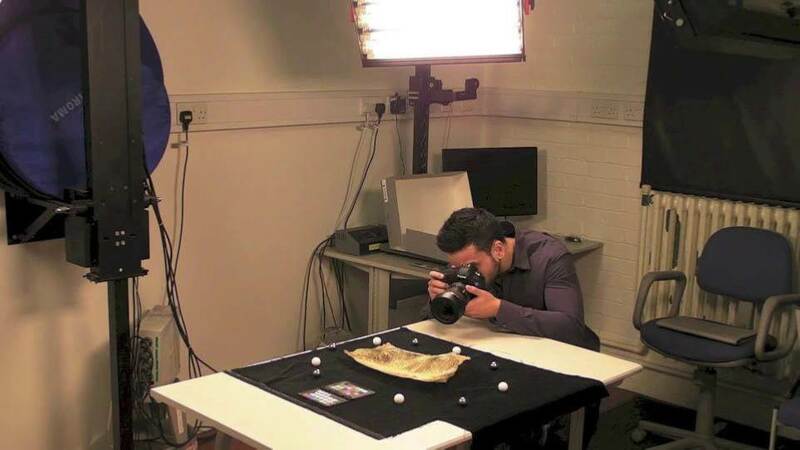 It aims to foster interest in the cutting edge technologies which are already revolutionising access to archives and manuscripts, to inform and educate about conservation and the role of digital imaging, and to contribute to developments in the digital humanities. Primarily it makes it accessible whoever and wherever you are. Vote for the Great Parchment Book blog now! 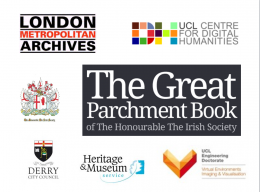 Last week the Great Parchment Book website passed another landmark with more than 80,000 page views since it was launched on 30 May 2013. 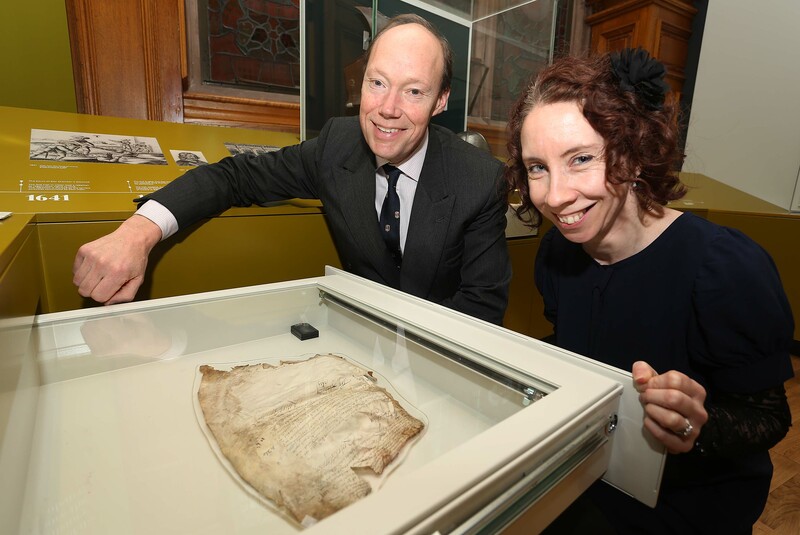 In addition, the Derry Guildhall exhibition – Plantation: Process, people, perspectives – which displayed an original folio of the Great Parchment Book for the first 10 months, has had 725,261 visitors from its opening in June 2013 to date, including 203,348 so far this year. The exhibition provides an interactive insight into the decisions and events of early 17th century, showcasing original maps, drawings and museum objects on loan from other institutions and using personalities to explore that period of history to provide an understanding of the conflicts of the past. The exhibition is open in the Guildhall daily from 10am-5.30pm including Saturdays and Sunday. Entrance to the Guildhall building and exhibition is free of charge. We are really pleased that the Great Parchment Book has been seen by so many both as an original folio in Derry, and remotely through the website, and that the story of the Plantation is continuing to be appreciated by visitors to the exhibition. 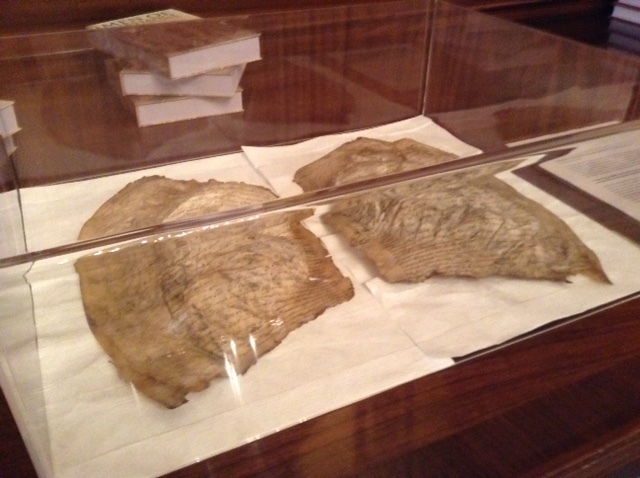 A rare book, ‘Pacata Hibernia, Ireland Appeased and Reduced Or, An Historie of the Late Warres of Ireland’, is to go on display as part of the Guildhall Plantation Exhibition, from April 2015. The Plantation Exhibition, currently located within Derry Guildhall, allows for changing exhibits and Derry City Council’s Museum and Visitor Services is delighted be able to showcase this hugely interesting rare book to a wide audience. ‘Pacata Hibernia’ was originally published in London in 1633 for Robert Milbourne. 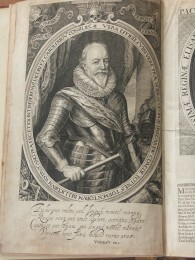 It is believed to be almost entirely composed by Lieutenant Thomas Stafford, who served under Sir George Carew. The very detailed maps and plans show the battle layout, military formation, horsemanship and fortifications of the times. These items will add interest to the exhibition showing further images of cartography which played a strong role in developments of the seventeenth century. This week the Great Parchment Book website passed another landmark with more than 65,000 page views since it was launched on 30 May 2013. In addition, the Derry Guildhall exhibition – Plantation: Process, people, perspectives – which displayed an original folio of the Great Parchment Book for the first 10 months, has had 525,146 visitors from its opening in June 2013 until the end of October 2014. A new object from the Hunt Museum Limerick went on display recently for a six month loan – a rather beautiful seal in gold with emeralds, diamonds and rubies, regarded as the personal seal of King Charles I. 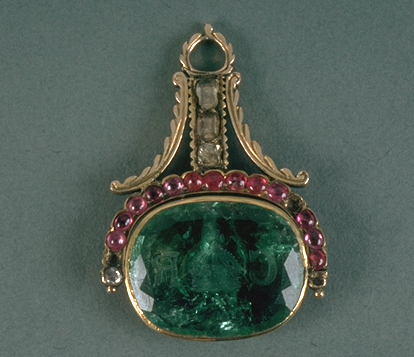 It is engraved with the letters CR (Carolus Rex) flanking a royal crown, and dates from the early 17th century. We are really pleased that the Great Parchment Book has been seen and appreciated by so many both as an original folio in Derry, and remotely through the website. It’s good to get feedback! 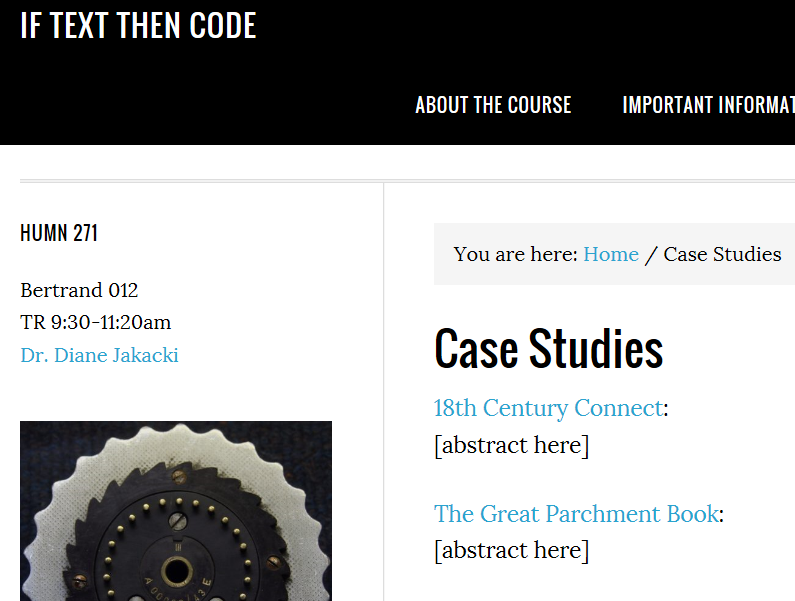 It’s great to get feedback from people who have used the Great Parchment Book website. 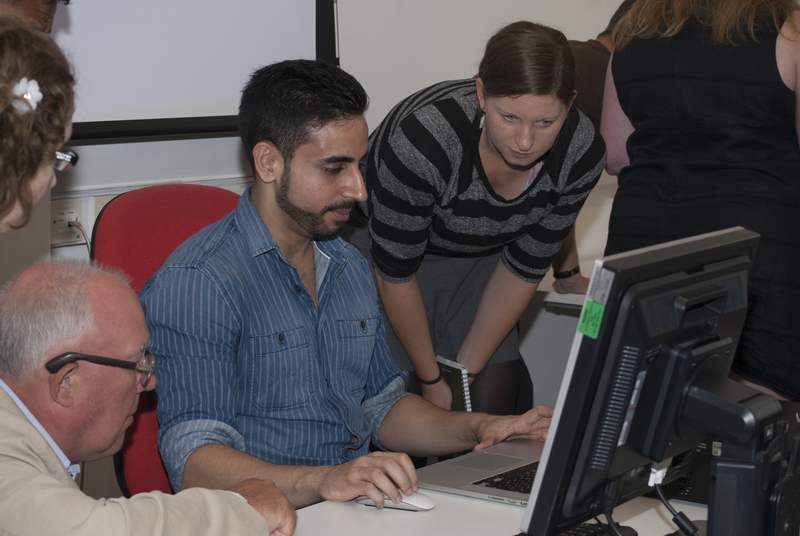 We are always keen to hear the results of your research or what you think about the website. You can email us by clicking on the Get in touch tab at the foot of every page. Thank you to everyone who made Great Parchment Book day on Friday (25 July) such a great success and a thoroughly enjoyable and thought-provoking event. We will be posting more images soon, but in the meantime you can see some images and comment on Twitter at #greatparchmentbook. Original folios from the Great Parchment Book were also displayed at the City of London Corporation Court of Common Council on Thursday 24 July alongside Hooke’s Diary which is also held by LMA. 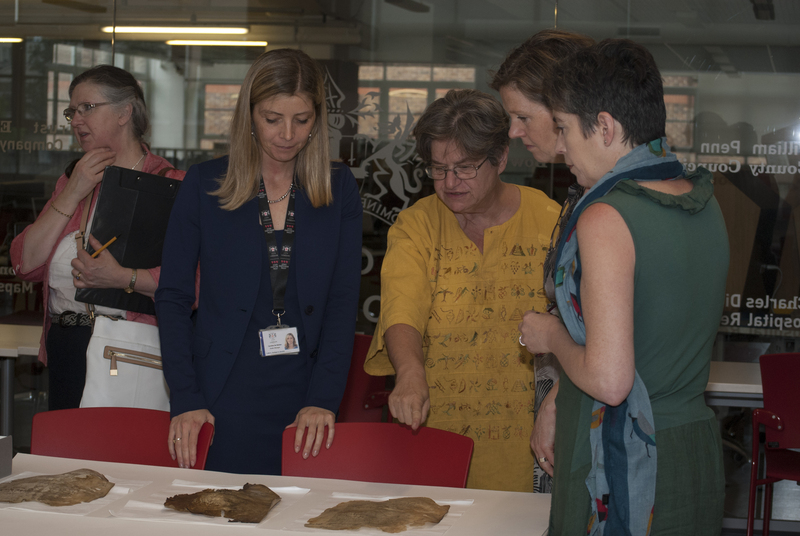 Both documents were there as award winners, the Great Parchment Book project having received a 2014 European Succeed Award, and the Hooke Diary having been added to the UNESCO UK Memory of the World Register in June. 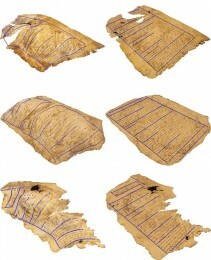 The Great Parchment Book has been added to the European History Primary Sources (EHPS) website. The purpose of EHPS is to provide an easily searchable index of scholarly digital repositories that contain primary sources for the history of Europe. 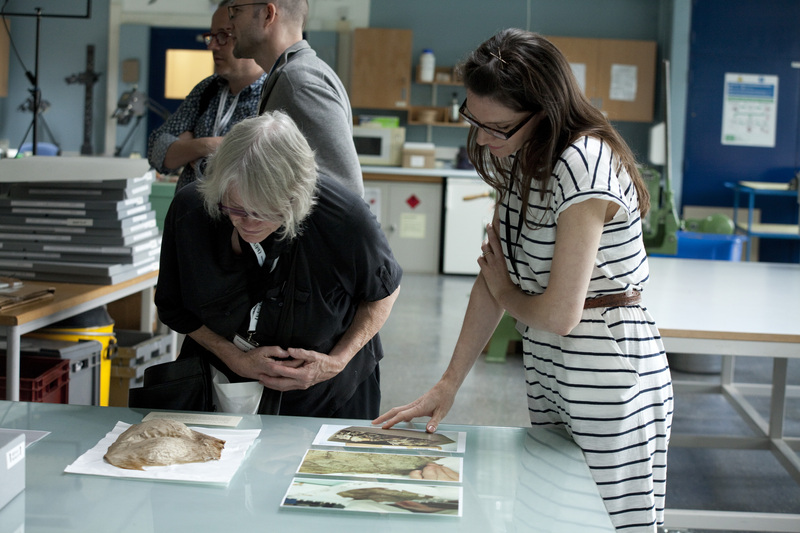 EHPS is a joint initiative of the Library and the Department of History and Civilization of the European University Institute in Florence, Italy. 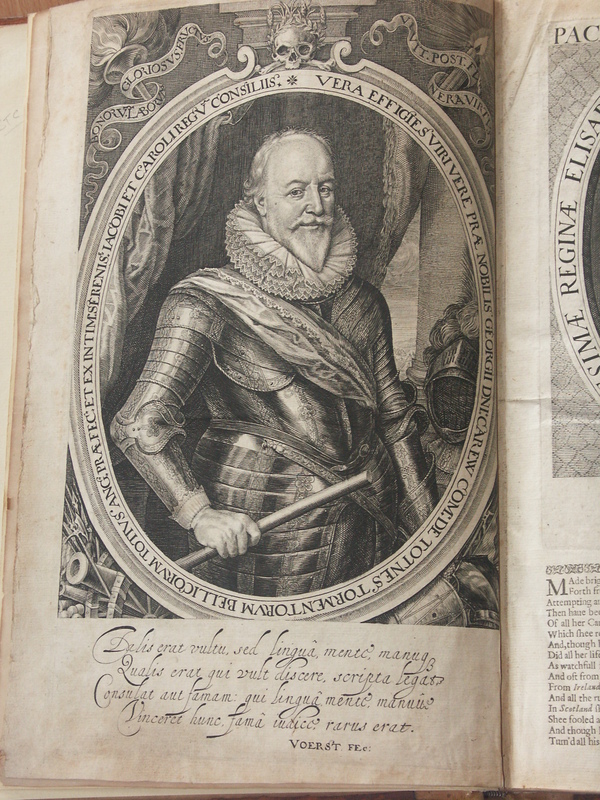 It is also part of the WWW Virtual Library History Central Catalogue that is hosted at the EUI. EHPS asks users to rate the sources to which it provides access, so please visit the site and rate the Great Parchment Book! Bernadette and Edward with an original folio of the Great Parchment Book. 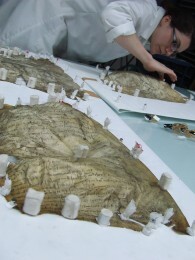 Studying a 17th century map from the Derry City Council archives. 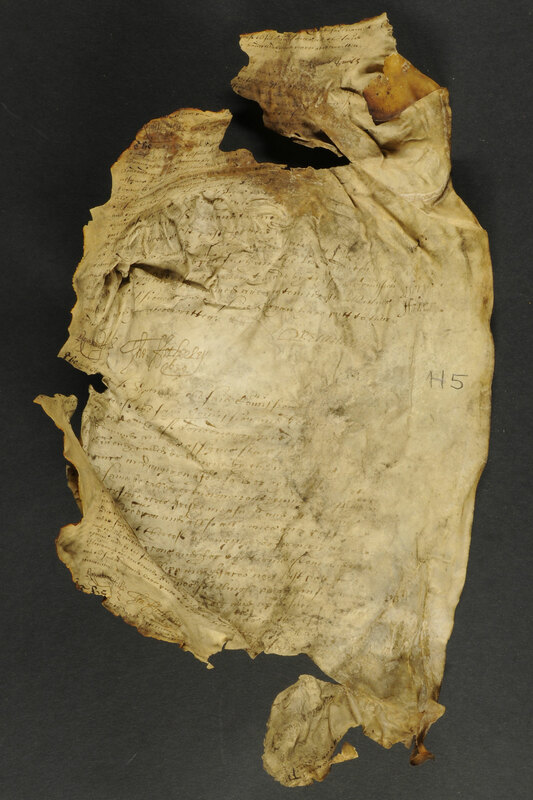 Looking at items from the archives of the Honourable the Irish Society: documents relating to surveyor Sir Thomas Phillips, one of the earliest leases relating to Lough Foyle and fishing rights, and a survey of the city from the early 19th century. Bernadette Walsh writes: As the city of Derry continues to celebrate the City of Culture award, after a hectic few days of ‘Lumiere’ and the announcement of the Turner Prize winner, the Guildhall is preparing for a new installation of archives for the Plantation exhibition. 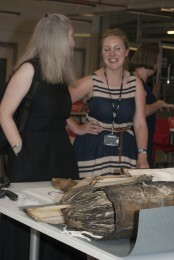 I’ve continued working with colleagues in London Metropolitan Archives selecting and preparing items for display. 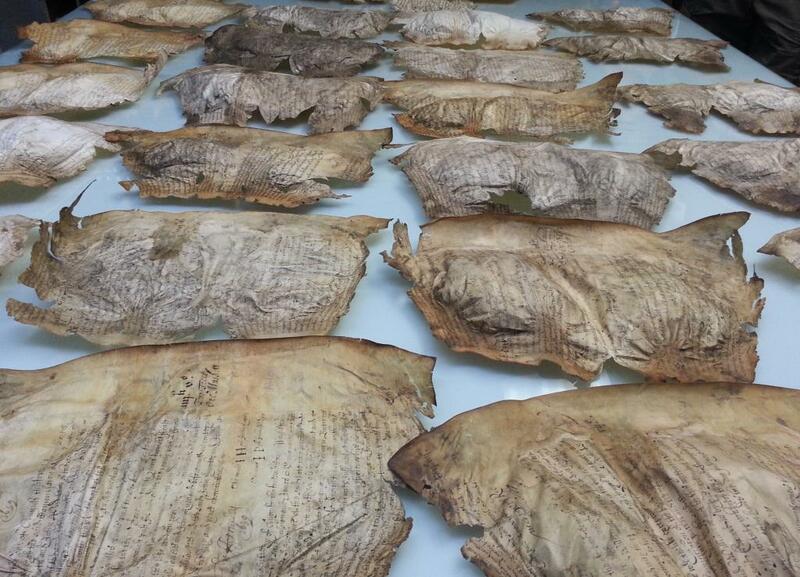 The previous loans which were installed in June will return to London this week and will be replaced with items selected from the Irish Society collection and items from the Derry City Council archive collection. 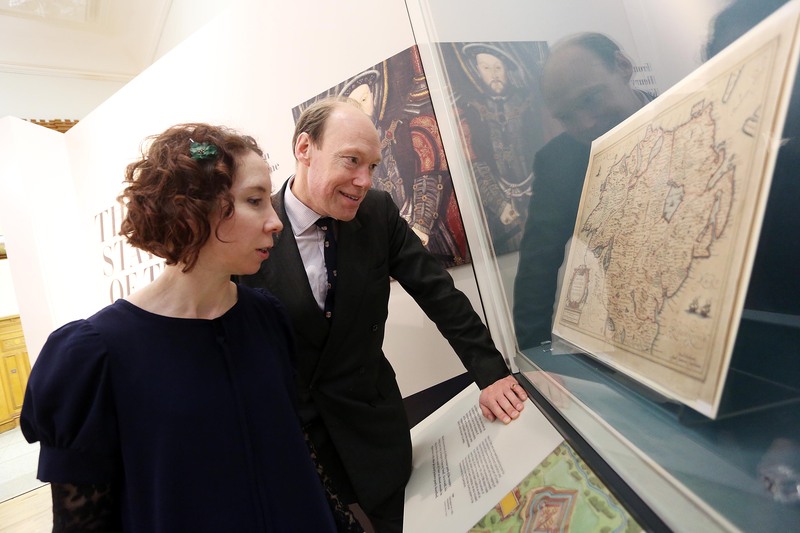 To date the exhibition has received thousands of visitors, with local people, visitors to the city, schools and community groups visiting the Guildhall to learn a little bit more about this very historic city. 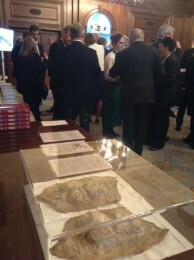 The newly selected archives going on display include a 17th century map, documents relating to surveyor Sir Thomas Phillips, one of the earliest leases relating to Lough Foyle and fishing rights and a survey of the city from the early 19th century, plus a further page from the Great Parchment Book. 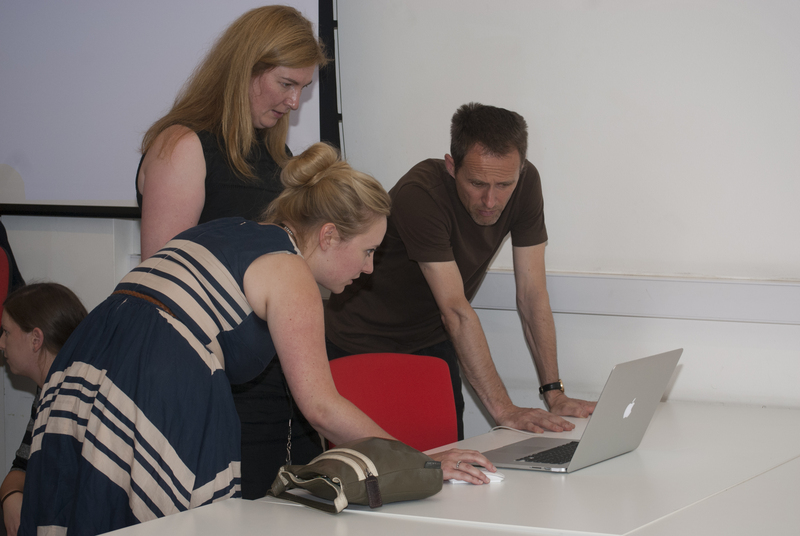 Keep checking out the blog for further updates this week!